Although conditions were far from brilliant the activity was a success with a lot of familiar and also a lot (approx 50%) of new callsigns in the log. Last fall I activated this nature park for the first time, so I knew where to set up my station. Although in between the trees, there was enough room to extend my vertical pole to 12m without getting stuck. I even managed to set up my full size inverted V for 40m. 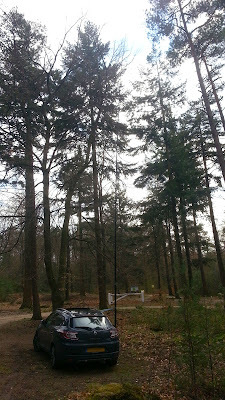 I started out on 20m, where conditions seemed okay, although there was only limited DX activity visible on the cluster. I stayed on this band for an hour and logged 83 contacts with most of the familiar calls at least an s-point down from their usual strength. DX came in from VE, UA9 and 4X. As HRD Logbook (for which I have a nifty widget on my phone) showed activity on 15m I went up there to find that propagation was open to the USA and Japan. In 40 minutes I logged only 20 calls but half of them DX from JA, W0/2 and 4X. Then I went down to 40m where I quickly found a free frequency (not always so simple). Conditions were great for the shorter distance between roughly 200-700km. A high number of DL and G operators ended up in the log. I received a lot of +10/+20 reports and handed out a lot as well. I was cheating a bit though with my already proven inverted V (full size for 40m, apex at 11m) in combination with a small amp that pushes out somewhere between 200-300w PEP. In total I logged 169 contacts in under 2 hours on this band. Discounting time for changing the antennas I was active for just under 3.5 hours, logging 272 calls from 40 different DXCCs. In between some showers there was plenty of sunshine allowing me to open my sun roof and pretend summer has arrived. Amongst the many OMs I spoke and I have got familiar with after meeting them at several activities were 10 fellow WWFF country representatives. A busy lot. ...and I met an OM I so far only knew through Twitter. A new experience altogether. Nou dat kun je wel een zeer geslaagde activatie noemen. Helaas was ik steeds afwezig. Ik nog wel even 1x tussendoor geluisterd op 21MHz, waar je volgens het cluster QRV was, maar kon niets horen. Volgende keer beter hi. Ja het was een drukte van belang. 40m was zeker gelukt. 15m is lastig op die afstand. Volgende keer beter. Met de lente nu echt in de lucht wordt het weer leuk om op pad te gaan.